The moment this plate of grilled treats was laid on our table, we knew. I first heard of Vincent’s Place from our foodie friend, Sir Dan, the eager beaver new restaurant lookout. *hihi (Thank you, Sir!) Since Vincent’s was just set to open in the future when he told me about his find, we kept on stepping by checking other food sources in our fair city off our list. Riding out to PMA recently, I thought I saw what looked to be the sign for a new restaurant as we whizzed through from the Panagbenga Park rotunda to the winding roads of Loakan. It all came together in my mind when I saw on my newsfeed that Vincent’s Place had finally had its grand opening. Taking over Vincent’s Place. Wee! NOTE: The view of the Cordillera Ranges from VP’s balcony. For lunch today, we picked out the intuno sampler, pizza canao, bikorot short order to be paired with two extra rice, and a glass of fruit juice called tropical treat. =) Quite an interesting healthful refreshment, that was with the passion fruit seeds in the bottom acting like pearls for the mango and carrot blend. Now we’re up to speed where the grilled sampler plate was laid in front of us and oh, how wowed we were at the serving. It looked so good, we knew that when we bit into the pieces of meat skewered on barbecue sticks that we’d enjoy it immensely. From the chat with her, we learned little info bites about this newly opened food joint as well as the answer to what probably is the question on most people’s minds hearing about Vincent’s Place, “who is Vincent”. According to her, this used to be some kind of convent and weaving center, and now that it’s revamped into a resto, it was named for one of the sisters who stayed here. Hello, Sister Vincent. After a short discussion that probably a squirt or two of citrus juice on the pizza would give it another facet of scrumptious-ness, we started heaping pieces of tender chicken and pinikpikan broth made creamy with coconut milk (Bicol+Igorot) onto our small mound of black-ish and white wild rice. As much as I thought it was a perfectly seasoned soup, I remarked that would’ve wanted the chicken swimming … better yet, drowning in that soup. As if God himself heard me, one of the waiters approached us carrying a bowl that looked like a giant aromatic diffuser. Melba toast with banana blossom dip joined the party at our table. Made of banana heart, watercress, spinach and cheese, this was one exciting appetizer. Appetites riled up again, we tamed it with another pot of tea, the organic mountain tea with honey. At a neighboring table of aunties, Race saw a cup of coffee delivered. That coffee looks good, he said admiringly. Again, God seemed to be listening in on our convo for as soon as our table was cleared off of the other dishes (to be packed to go), the servers again brought us each a cup of potent-POTENT coffee. Americano for Race, a frothy cappuccino for me. (At least, we think, my better half’s cup was an Americano. Or was it a latte? Anyhoo.) It was so amusing that when he poured all of the milk from the small pitcher into his coffee cup, the mixture stopped exactly at the brim. They got their measurements down, don’t you think? X marks Vincent’s Place for good food in Baguio. It’s also now Race’s place … and my place. It could be your place, too. I’m sure, Sr. Vincent would be proud of her namesake resto and their transcendental offering. Food: Cordilleran dishes with a little twist here and there. Price: For the classy sturdy rustic furnishings and awe inspiring interior, one would think the food at Vincent’s would be up there, but really, the price is quite reasonable. Main course selections are good for two. Mayat ah! After we settled our account (for the foodstuff we ordered), we ended this lunch turned food tasting gorge fest with a last stop at Vincent’s specialty shop. Lots of pasalubong worthy items were there like woven bags, wood carvings big and small, coffees, cookies, jams, chili oils, etc. These items converged in Baguio Vincent’s Place from the highlands (like Tabuk, Kalinga and Sayangan, Mt. Province). Fruit wine varieties: Honey ginger wine, guava wine, coffee wine, rambutan wine, pineapple wine, and guyabano wine. Somehow, Ms. Ann found a way get our gobs busy again by offering us a taste of the different selections of fruit wines from the shop. =)) While taking shots, I noticed that there was a staircase leading downstairs and I inquired from the staff if that was going to be a B&B. They told me, it’s actually a function room that could accommodate 120 people. I can see it now, parties and celebrations at Vincent’s Place! Shot after shot we took and it led to us coming home with a bottle of guava wine and honey ginger wine, our top picks from the lot. ***We can’t thank you enough, Ms. Ann, for stuffing us silly with the fantastic dishes and drinks of VP. Congratulations and more power to all at Vincent’s! Why, hello there, Mario! Caught me online … because I’m adding more details to this already long post for Vincent’s Place. *hihi Tasted and experienced so much so lots to tell you too. I know right, good thing, it’s just at the “beginning” of Loakan. Yes do try their blooming edible flower tea, it’s interesting to watch. I was curious what kind of flower was in it … and it helped us a lot to try everything they were so generous to give us. Ayy online ang food blog goddess. Hello, Xine!! Gusto ko rin lumafang ng bongga to the highest level kaya check ko muna tong blog mo para ready ang datung at hindi ako pagjugasin ng plato. Char! Heehaha! Thank you so much for the support! Good thing, Vincent’s Place food selections have easy on the pocket prices. I was majorly surprised, at the carrot cake especially. Such a huge slice and so good and it was just P70. Also, we were told they make everything at the resto, like the blood sausage, smoking of the meat (etag), baking, etc., so yes, they can keep costs down low. Vincent Place intuno looks very delicious. How many pieces in that sampler? Hello, Sally! I know right. We were so awed when it arrived at our table. Vincent’s Place intuno sampler has 9 sticks, 3 of each variety (chicken isaw, pork isaw, and pig ears). Hello there, Tess! I was pretty surprised seeing the bottle label, too. The fruit wine selections at Vincent’s Place go for P280 to P300 a bottle. I think it’s the ginger honey wine that was the most ‘expensive’ (at P300). So it is a restaurant. I also saw the Vincent Place sign before and I thought it was a bed and breakfast. Its nice that they serve Cordilleran fare with a twist. The bikorot pinikpikan with coconut milk must taste really good. 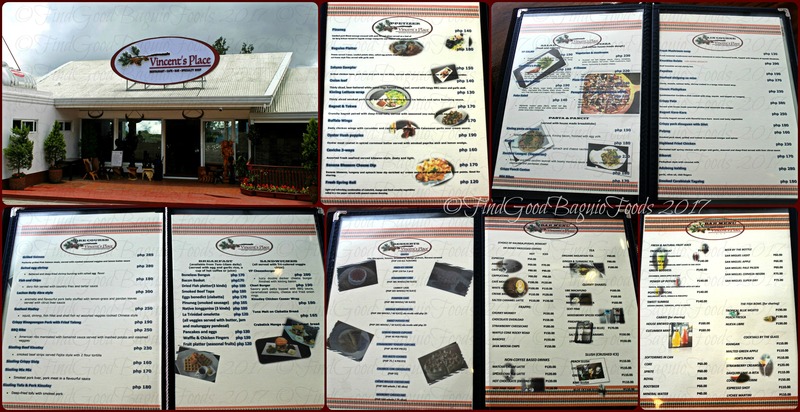 I agree, we need more Cordilleran themed menus here, so the visitors to Baguio could have another item to check off their itineraries.